My name is Nigel Burton. I'm an English author and journalist working on a new book about the MR2. 1. Does anyone have a photo (or photos) of the MR2 Bathburst I might be able to use? As an Australian-market special I'm struggling to locate a decent photo over here on the other side of the world. 2. I'm looking for owners willing to share their MR2 experiences for the book. Some things to consider: why did you buy an MR? What attracted you to it? How did it measure up to your expectations? What has gone wrong? What have you done to it? The best stories will appear in the book (due next year). I don't know if you are aware of a very special MR2 now based in Tasmania that was used by Toyota as a prototype for the Bathurst Models, and owned by Tim Johnson. You may see on the list of drivers names, one Juan Manuel Fangio as as well as many well known locals. The MR2 Owners Club recently discovered this car on our recent MR2 Nationals event while touring Tasmania last year. Below I have included a page from our club newsletter with some details. The original PDF of that page is a bit large to PM so if you want a better quality copy you would have to PM me with your email so I could send it to you. I don't have Tim Johnson's contact details at the moment, however I could possibly obtain them for you if required. What an incredible find! I thought the Bathurst car was an official Toyota 'works' entry. Incredible that it was "retired" to a backyard beneath a tree. If similar treatment had been handed out to it in my country the bodywork would have had more holes than a six month old piece of Swiss cheese. "I thought the Bathurst car was an official Toyota 'works' entry"
The Bathurst models were raced succesfully, notably at the Mount Panorama track at Bathurst, from which they got their model name. The pic shows Colin Osbourne's Team Toyota SW20 Bathurst no 13. I'm not sure exactly how many Bathurst models were sold in Australia but they are quite common here. Just to clarify further, Tim Johnson's car is a 1991 model with the early type spoiler and the Gen2 motor. As has been mentioned earlier, it had considerable racing sucess, and it was used by Toyota to develop the later Bathurst models (post 1994) that of course had the Gen 3 motor. For a 20+YO race car, Tim's car is still fully functioning, with a full roll cage and is still taken to the track ocasionally. Looking into the engine bay I couldn't notice anything different to other early model SW20's, but I believe Tim said that it had some engine tuning, however he didn't know specifically what was done. Im in regular contact with Tim, if you need anything let me know. Tim is racing his car this weekend in te regularity series at Symmons Plains racetrack in Tasmania. I know he had the motor rebuilt but not sure of the specs. 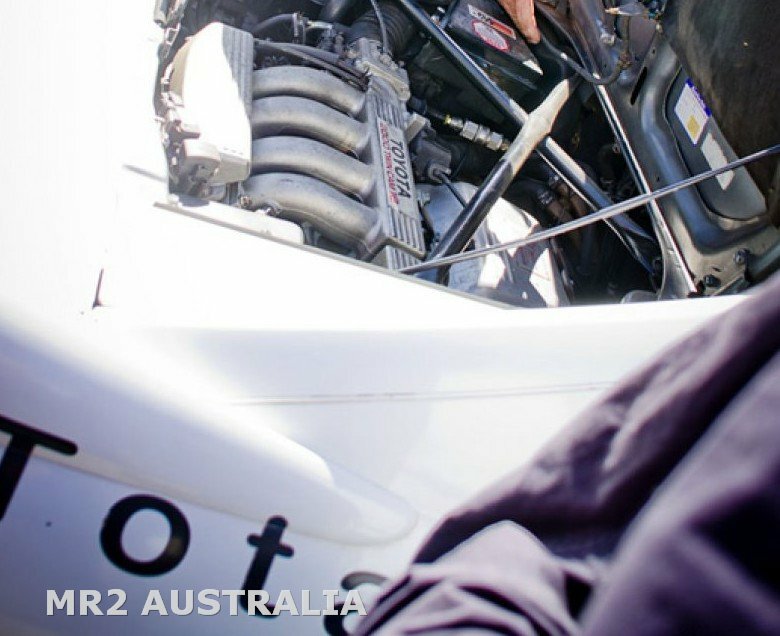 The concept Bathurst MR2 was built on the success of the MR2 at the Bathurst 12 hour as "Reddtarga" explained. However there was another reason for introducing the Bathurst model. At the time, around 1994, the Australian Govt. introduced a "luxury tax" on imported vehicles. This bumped up the price of an MR2 (only one spec MR2 for Australia) to over $60,000. To meet the market demand and to come in under the luxury tax Toyota Australia introduced the Bathurst model. It was a stripped MR2 with 38kgs taken out to lighten it and 12% increase in engine output. The first Bathurst MR2s came out with no radio, no ABS, no air conditioninf (even though air con was an option extra on all MR2s) no centre consol. After the initial release, later versions had most options fitted. There's an email from "David Scott" detailing the bathurst races and how well the MR2 went which might be of value to you. I did a search and found an earlier post by RDS. Hope its helpful. I can't vouch for its accuracy, however. I have a '95 Bathurst and I have seen another list of Australian sales figures stating 77 Bathurst sold that year as well as 25 GT's for a total of 102 (list below says 69). I'll do a further search and see what I can find. to answer your question from the same file. where should i upload this file anyway. this poo poo is interesting. no idea where it came from, but its an excel file of mr2 production.. :S nfi how reliable it is. Hi, just came across this old post, I actually drove one of those MR2's at Bathurst in 2000, I first the first driver. I don't know if you ended up publishing anything or if you got the information you were after but I'd love to see anything you found. Also, if there's anything you'd like to know about the car, feel free to ask.